Flower Power | CowParade New Figurines | One Price Low Flat Shipping! 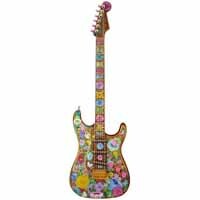 From Westland Giftware's GuitarMania mini Fender guitars collection, Flower Power. Designed by artist, Jacqueline Kahane Freedman. Sponsored by United Way of Greater Cleveland. Made of hand-painted resin. Measures 10" tall. Comes with guitar stand, packaged in plush black guitar-shaped case. The intricate detail and colorful blooming flowers creates a feeling of summer joys and sounds throughout the guitar. Flower Power is sure to bring happiness to anyone who views this harmonious design.d neck of the guitar, as if the car is speeding down the highway. The high shine appearance completes the look of a true car. This GuitarMania figurine has official Fender licensing logo printed on the neck of the guitar.